Residential home owners and multi-tenant property managers can now rest assured. We use advanced drone technology to inspect roofs for damage before and after a storm, providing you with the information you need to file an insurance claim. 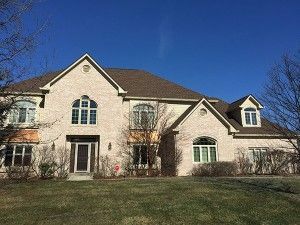 Universal Roofing & Exteriors is experienced at every kind of roof replacement and roof repair on single-family homes, condominiums, apartments and commercial buildings. We specialize in fiber cement siding, vinyl, LP SmartSide, aluminum and any number of given composites. We offer a variety of window and door options to help you achieve energy cost savings and long-term performance. From small drywall repairs to whole-home interior and exterior painting, our experienced team is ready to handle your project. We can talk to adjusters, deal with the insurance claim and make sure you are compensated for damages. We offer drone-based roofing inspections designed to save property owners time and money. With over 30 years of experience as a general contractor, our team of skilled professionals is the safe choice for all of your commercial roofing and siding needs. Thanks for start and completing the job so promptly. We appreciated the way you cleaned up afterwards...Elaine M.
Since 1986, Universal Roofing & Exteriors has been a quality-driven and community-focused roofing contractor in Indianapolis. Because we have been family owned and operated for nearly 30 years we understand the importance of conducting business honestly and professionally with each of our customers. Whether you need a simple repair or a complex renovation we’ll always put your needs first and bring you a finished product that you are satisfied with. Roofing ­— We do residential and commercial roofing. We install, maintain, and replace asphalt shingles, slate shingles, cedar shake shingles, modified roofing, flat roofs, and more. Siding — Fiber-cement siding, which is more appealing and durable than other types of siding. Windows and Doors — Various styles of windows and doors from our two trusted ENERGY STAR Partners who specialize in quality, durability, and energy-efficiency. Gutters — We inspect, clean, repair, replace, and install gutter protection systems to protect your home from water damage. Drywall and Painting — We’ll take your home renovation to the next step by improving your home’s exterior with the finest quality products. Skylights and Insulation — Our dependable contractors are trained to install these products for the beauty and warmth of your home. So why should you choose Universal Roofing & Exteriors for your renovation project? We’ve seen the competition for decades and know how to do things better. We take pride in the fact that we use the highest quality products and utilize the most professional installation practices. Our workers are highly trained and certified to make your home more beautiful and functional than ever. To read more about our company and services click here for a downloadable brochure. We’re proud to serve central Indiana. If your roof is experiencing old age, buckling or curling shingles, or missing shingles, give us a call at (317) 257-0779 or fill out our request form. We’re happy to work on your home and make you part of the Universal Roofing & Exteriors family.